Since our Back from the Brink project started in summer 2017 there has been a huge amount of work undertaken to achieve our aim of restoring and maintaining a network of limestone grassland sites. 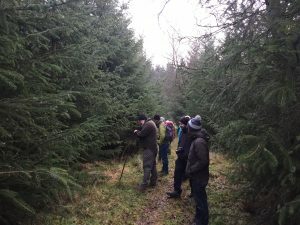 To date, practical conservation work led by our Conservation Officer, with the help of numerous volunteers has amounted to an impressive total of 221 volunteer days. 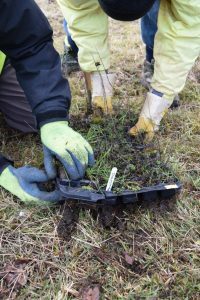 This work, carried out across a number of sites particularly within the Stroud valleys area, is helping to secure the future of a number of rare and threatened species. Soil scrapes have been created at one site to aid the regeneration of Juniper. This plant has declined over time due to a lack of grazing and grassland management causing the surrounding vegetation to become rank with fast growing grasses and gaps to close up. Without areas of bare open soil Juniper seeds cannot germinate so this work scraping back the vegetation will allow a new generation of Juniper plants to grow. Scrub removal has taken place at several sites where it is starting to encroach and shade out the grassland. 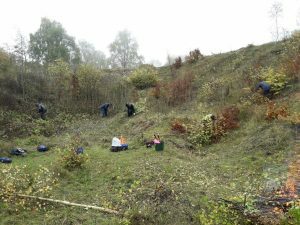 By carefully removing scrub we are restoring a balance of low scattered scrub, benefiting species such as the Duke of Burgundy butterfly and the Adder, while opening up the grassland and creating wild-flower rich swards and helping species such as the Rugged Oil Beetle and Fly Orchid. Work to get potential reintroduction sites into good condition to support the Large Blue butterfly is also underway. The project aims to facilitate at least one further reintroduction of this butterfly to Gloucestershire, so volunteers have been out planting Wild Thyme and Wild Marjoram, the Large Blue’s larval food plants, to help the butterfly survive in the future. Further work to help the Duke of Burgundy has also taken place. 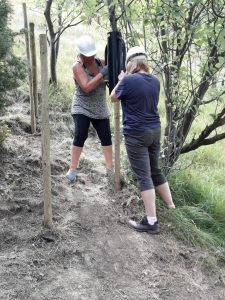 Our Conservation Officer has been working closely with the National Trust and the Commoners at Rodborough Common in Stroud to allow temporary electric fence paddocks to be installed. This allows us to move the previously free-roaming cattle to those areas of the common that are most in need of grazing. After just the first year of this new system we are already seeing fantastic results which will keep scrub at the right level while giving more room for cowslips to thrive, both of which are needed by the Duke of Burgundy. More practical conservation work is planned for this winter so look out for more updates in the coming months! BftB Community Engagement Officer, Limestone's Living Legacies.